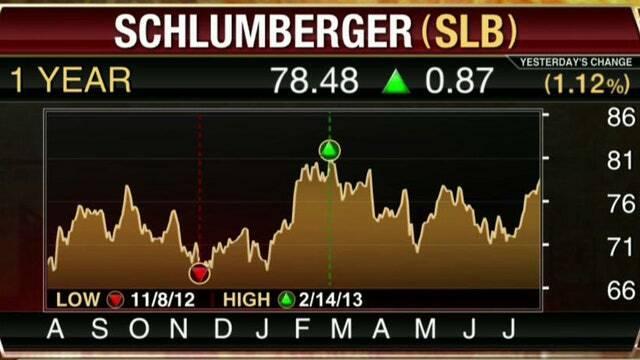 FBN's Diane Macedo breaks down Schlumberger earnings. Schlumberger (NYSE:SLB), the world’s largest oil field services company, said Friday its second-quarter earnings soared 49% amid higher international activity that overshadowed weaker revenue in North America. Shares were up 4.1% at $81.70 in early morning trading. The company reported a profit of $2.1 billion, or $1.57 a share, up from $1.4 billion, or $1.05 a share, in the year-ago period. Excluding one-time items, adjusted per-share earnings rose to $1.15 from $1.01, beating Wall Street calls for $1.10 a share. Revenue climbed 8.1% to $11.18 billion to beat estimates of $11.11 billion. Operating margin grew sharply to 23.9% from 17.2%. Schlumberger has reported significant revenue growth in recent years, as oil and gas production ramped up in Canada and the deepwater U.S. Gulf of Mexico. Schlumberger’s international segment accounts for more than two-thirds of its revenue, and in the latest period, the Europe/Commonwealth of Independent States/Africa region posted 6.9% revenue growth. Revenue in the Middle East and Asia rose 28%, while Latin America revenue grew 3%. Oil field services revenue from North America, generating most of the company’s top line, slipped 0.6% to $3.36 billion.